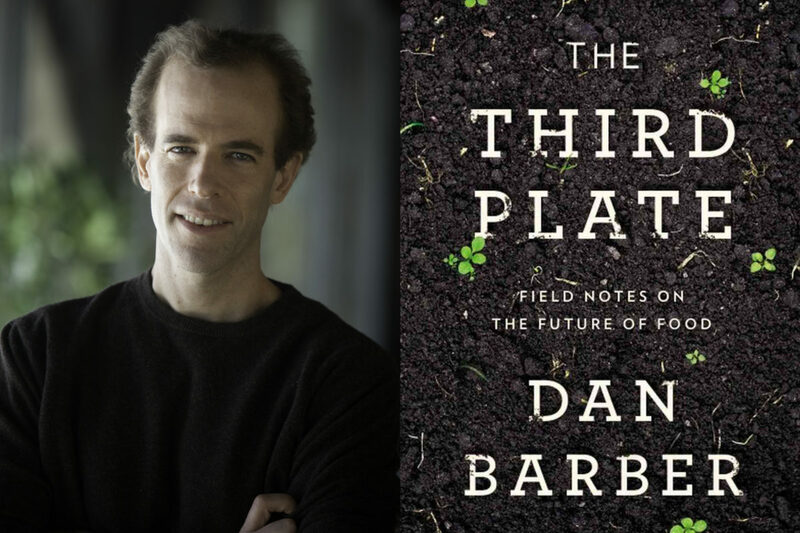 Dan Barber’s book, The Third Plate: Field Notes on the Future of Food, was released this week, graced with blurbs by everyone from Ruth Reichl to Al Gore and Malcolm Gladwell. And if it feels like it was a long time coming, that’s because it was. The chef and writer spent over a decade visiting farmers and other food producers and ruminating about the role their work plays in the wider natural world. Meanwhile Barber was also running a world-renowned restaurant, Blue Hill at Stone Barns, part of a small constellation of other efforts, including Blue Hill restaurant in New York City, the Stone Barns Center for Food and Agriculture, and Barber’s nearby family farm. His position at the helm of Blue Hill, surrounded by the thriving agricultural scene in New York’s Hudson Valley, and his forays into other parts of the world to explore food systems, inform the book, just as his writing informed Blue Hills’ menus. The latter, which are not menus at all, but a rotating selection of foods Barber considers relevant, sustainable, and delicious, is at the heart of the idea behind the book, which offers a vision for a radically holistic approach to food and farming. We spoke to Barber recently about this interplay between cooking and writing and some of the farmers who made his journey possible. Let’s talk about the title—what is the “Third Plate”? The Third Plate is a metaphor for a way of eating, which is about cooking and celebrating the whole farm. Not just-the-farm to table ingredients we covet, like asparagus and heirloom tomatoes, but the grains, the legumes, the cover crops and forage crops even that all work together to support the health and resiliency of the land. I was led to these farms because I was looking for the story of how the ingredient was grown or raised and what I discovered is I was asking the wrong question. I needed to look at the whole system that produced what I was tasting. I started off the book with wheat, because I had this experience with wheat that changed my life. I went to this guy, Klaas Martin’s, farm many years after I began buying and cooking his wheat and waving the farm-to-table flag. But I got to the farm and I looked around and there was no wheat. So I spent the next two days learning about all the other crops that were there to support the wheat: The buckwheat, barley, millet, and clover. They are all planted in this meticulously timed arrangement so that they give the soil a fertility that ends up providing the right cocktail for the wheat. And yet I wasn’t cooking with any ingredients I was seeing. So I realized I had work to do in my cooking if I really wanted to support the wheat, which is to say I needed to support the soil. Rather than a linear farm-to-table relationship, you seem to be talking about a more circular conversation, like farm-to-table and back to farm. That’s the beauty of the movement at its core. This conversation has begun that wasn’t there 20 years ago in the way it is today. For chefs its required dialogue and it’s a continued conversation. Buying, say, a local tomato isn’t something to hang your hat on as a way to change the industrial food system. Because while the message about local food has gone viral, the implication for how our farmland is being used hasn’t fundamentally changed. And the forces that affect those farmscapes are not changing. Big agriculture is still getting bigger. You’ve gone as far as to serve “Rotation Risotto” on your menu, which uses greens and grains from cover crops that probably wouldn’t ever grace a menu otherwise. Is the idea to move away from what some people see as the “precious” aspect of local farm food? Exactly. There’s real work to do here to change the discussion. No one farms anymore, so the amazing thing is that we can reconnect to the natural world through a good plate of food. You don’t need to farm, but you do need to do the work of seeking it out and supporting it, so we can continue to have that pleasure, and our children and grandchildren can too. The more I got to know soil, the more I realized it has a personality. Klaas [Martins] is the one who taught me the language of soil. Walking the field, if we see chicory or Queen Anne’s lace, I learned that the soil is low on fertility. If we see milkweed, the soil is lacking in zinc, or when there are yellow flowers, it’s lacking in sulfur. So Klaas is constantly readjusting his farming strategy to respond to what the soil is communicating. And it speaks really clearly. It’s not like you have to be some sort of Kumbaya guy to understand what it needs. But if you feed the soil, it produces the jaw-dropping flavors we love. Soil is the hero of the book. I was really excited about it, but trying to hide it [in early drafts], because I was worried the reader’s eyes would glaze over. Then my editor said: “This is going in the front of a book, and if people don’t like it, screw ‘em.” I look back on that as a very pivotal moment. I like the idea of creating “vibrant communities above and below ground” even if the latter is invisible to most of us. It really has the same weight, which is why we’re “subterranean-ly impaired.” The implications of not understanding soil are profound–if not for ecological reasons, then just for the pure pleasure the chef can bring to a table. Klaas changed my life because I will never pass a field in the same way again. I’m always looking for different weeds, plants, colors, etc. that might indicate what the soil is saying. When you’re paying attention to soil, you never feel alone. I drive through [The Hudson Valley] a lot and I know which are the good farms, based on what I can see about their soil. Millions of people have seen your TED talks–on The Foie Gras Parable (2008) and How I Fell in Love with a Fish (2010)–and the topics of both talks appear in the book. What is the relationship between the talks and the book? I was in the middle of writing those chapters, so that’s what I was thinking about at the time. But I guess the talks helped me create an organizational framework for the book. Food production is a disturbance, but the goal is to “disturb feelingly,” to disturb in a way that mimics natural systems. Whether you’re talking about a goose, a fish, or raising wheat, you’ve got to intimately know the environment from which it is coming and mimic nature to produce the best flavor. I wouldn’t have been able to appreciate Eduardo [the foie gras producer in Spain] or Miguel [the fish farmer, also in Spain] without Klaas. Weeds are an ecosystem and they need to be studied. It’s true of predator fish as well. None of these producers are working toward a specific goal, they’re working toward the whole. Do you want to speak to the role of the chef in all this? Some say that a chef who is serving $95 tasting menus shouldn’t be talking about feeding people. And my answer is that in order to create a pattern of eating that really supports the whole farm, the whole system, we need chefs, because they are the curators of flavor. In doing that they can help create a cuisine, and that’s an unfortunate word because it has elitism written all over it, but it really describes an everyday pattern or expectation of what we deserve on our plates. And the American expectation is the 12-oz portion of protein two times a day. That’s an agricultural phenomenon our soil has given us because of a glacial phenomenon; we’ve had some of the best soil in the history of the world. But that’s changing … and the idea that we can support a diet like that into perpetuity or even into the next generation is becoming more and more fraught. Chefs have an important role because they are increasingly cultural icons and they have power to broadcast the message. But the message shouldn’t be, “I bought local wheat from a farmer, look at how farm-to-table I am.” It should really be about the entirely of the meal, at different points in the season, depending on a hyper-locality, which requires a conversation that is continually ongoing. And you can’t do that in the same way if you don’t cook. The notion of a gourmet meal–with caviar and foie gras–is being turned on its head. The chefs doing the most exciting work are looking for the uncelebrated foods, the bycatch fish. They’re like the statue of liberty, saying: “Give me your tired, your weak, and your hungry.” In other words, the unheralded crops that we need to celebrate and make delicious. That’s a real role for chefs. I am a professional cook and totally agree. We are the ones that can get that message out, with our food. Thanks to Dan Barber for bringing this important thought to the forefront! I think Dan is on exactly the right track. While we have not tried to sell much of it, we have incorporated edible or usable crops into our lemon/avocado/ fig orchard covercrop, including lima beans, fava beans, black-eyed peas, barley and sunflowers. Greater consumer interest in these crops would make this practice even more attractive. Yes! Soil is the hero! I am a huge fan of soil, and was highly interested in what you had to say in this interview-- how we can tell what nutrients a soil lacks by what is growing there naturally. So amazingly cool! People getting in touch with soil -- I feel that is a really up-and-coming element that will bring us all one step closer to intimately understanding the biodynamic cycle we are all part of. El mejor foie gras del mundo, sousa farm, según el mejor chef de Estados Unidos. On a planet of 7 billion plus inhabitants, how we eat is the environmental movement we find ourselves in. To that regard, soil is ground zero. I look forward to reading Barber's book. With over 7 billion plus inhabitants on the planet, the way we eat IS the next environmental movement. Creating healthy soil and learning to maintain it as a living organism, is the foundation for how we can feed people well. With the sensibility of a steward, Dan Barber comes along at just the right time. Thank you Dan Barber for your thoughtful and important work and 10 years well spent.